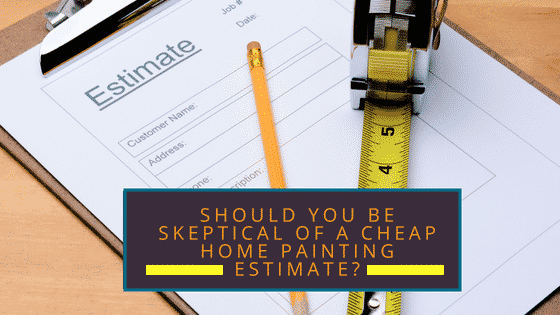 There are several things that you need to think about if you are skeptical of a cheap home painting estimate. The first thing is whether or not, they are actually a legitimate painting company. This means that you are going to need to check the credentials of the painting company. Therefore, they will need to have the proper license. It is going to take some money and work for the company to get, so it is going to be a lot easier for the company to work without a license. If the painting company is not properly license, this can be very dangerous for you and the house. This is because you want to make sure that your home and family is protected. Therefore, the painting company is also going to need to have full insurance. The second thing is if the preparation for painting was hurried or they did not prepare at all. The preparation is a very important part of the process when it comes to doing any type of painting. This is because they are going to need to patch any of the scratches, dents, or holes that might be in the wall, so that they are going to be able to give a more complete look to the paint job. But the cheaper companies might try to skip this step so that they can save some money and time on the job. Even though it might not always be necessary to prime before you paint, it is going to be needed most of the time. Therefore, if the painter does not do this, then the paint coverage is going to very poor and the paint might begin to fail. The primer is going to need to be used in the places that have been repaired or patched. This is going to be especially true if you are going to be majoring changing the color of the wall. If you are trying to block out some odors or stains, then that is another reason for you to use the stains. This means that you are going to need to be skeptical if the painter does not prime the walls. The third thing is if the painter is using cheap supplies. Most of the time, when it comes to home painting, the biggest expense is going to be the supplies that they use. Therefore, if you are using the budget painting company, they are going to try to save some money by using the paint that is lower in quality so that it is cheaper. This means that the paint is not going to be able to hold up as well to the wear and tear that happens to the wall on a regular basis. The work is going to look a lot more attractive and finished when a higher quality paint is used on the wall. The fourth thing is if you receive bad customer service from the painting company. Of course, this is also going to be very frustrating to the customer. Some of the things that you might experience is if there is a long wait for their services, no one answers the phone when you call, jobs take a lot longer than you expected it to, and there are mistakes that are going to happen with the scheduling. A lot of times when a company is trying to save money, then they are going to reduce the amount of office staff that they have. A good office staff is going to be essential for a quality painting contractor. Things are going to happen from time to time and it is important to remember this but if it happens a lot, then it is going to be a problem. All of your emails and phone calls are going to need to be answered in a prompt way and none of the important paperwork should be lost in the process. The fifth thing that you need to be looking when you are getting the painting estimate is if the company has workers that are unsatisfied with their job or not even qualified to do the job. This is because when you have a painter coming into your home, then you are going to want someone to be able to trust them. Therefore, all of these painters are going to need to be well trained and happy with their job. Making sure that workers are trained is going to be a huge investment of their money and time. This means that it could be another place that the painting company might try to save some money. When the workers are not trained properly, then there work is going to be sloppy. A trained worker will make sure the paint is done correctly so that every person inside of the home is going to be safe while the house is being painted. These are the top five things that you need to be looking for when you are getting an estimate of your home painting that you want a professional painter to do.